Introduction: The correlation of positive result in direct antiglobulin test (DAT) with in vivo hemolysis is important for the patient management. 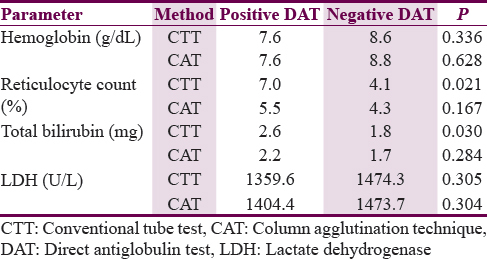 This study compares the correlation of tube-DAT and -DAT by column agglutination technique (CAT) with in vivo hemolysis and reviews the appropriateness of the requests for DAT in patients with various clinical conditions. Patients and Methods: A total of 250 consecutive patients referred for DAT were enrolled for the study. Laboratory indicators of hemolysis were obtained from the computerized hospital data management system. Hemolysis in patients was graded using predetermined criteria. DAT was done using CAT and tube techniques and graded on the agglutination pattern. Results: Among 250 patients studied, 160 patients were from the hemato-oncology unit, and 47 had an autoimmune disease. Laboratory evidence of hemolysis was seen in 170 patients (severe: 45.88% and moderate: 54.12%). Positive DAT by tube technique was seen in only 41 out of 65 patients whose DAT was positive by CAT. Hemolytic anemia was the single largest cause in this group. Positive predictive values (PPVs) of tube and CAT were comparable. On comparing the strength of agglutination with the in vivo-hemolysis, 1+ reaction by CAT had low PPV. Conclusion: The present study shows that mere DAT positivity does not always indicate in vivo hemolysis. Hence, while recommending the routine use of CAT for DAT, we suggest to incorporate the strength of agglutination reaction in laboratory report for the ease of interpretation. The direct antiglobulin test (DAT) detects autoantibodies bound to red cells and is probably the most widely performed technique in any immunohematology laboratory. Various laboratories have replaced old conventional tube technique (CTT) with a more sensitive method such as the column agglutination technique (CAT). Evidence of clinical hemolysis in patients has become an indication for autoantibody screening by DAT in recent times. Although DAT helps in detection and characterization of autoantibody in an autoimmune disorder, often, a positive DAT result may not be associated with in vivo hemolysis. We, at our blood center, performed DAT using CAT in parallel to CTT. It is proven that CAT is more sensitive than the tube technique, but there are limited studies comparing the DAT positivity by these techniques with the in vivo hemolysis. Hence, we planned to investigate the association of CTT-DAT over CAT-DAT with in vivo hemolysis and to review the appropriateness of the requests for DAT in patients with various clinical conditions. Two hundred and fifty consecutive patients referred for DAT over a period of 3 months were enrolled for the study after obtaining the written consent. The study group consisted of 138 males and 112 females. Their median age was 38 years (range 2–80 years). The referral diagnosis was collected from the patient records. Hemoglobin level, mean corpuscular volume (MCV), and platelet count were obtained from the computerized hospital data management system. Laboratory indicators of hemolysis such as reticulocyte count, serum bilirubin level, and lactate dehydrogenase (LDH) level in serum were also accessed from the same computerized database. The following laboratory values were considered to suggest hemolysis: hemoglobin <9 g%, reticulocyte count >2%, total bilirubin >2 mg%, and LDH >500 U/L. The presence of two of these criteria indicated moderate hemolysis and three or four altered parameters suggested severe hemolysis. The anticoagulated blood sample of the patient was used for DAT. Tube test was performed as per the guidelines given in the technical manual by the American Association of Blood Banks. The validity of the negative test was confirmed by adding IgG-coated red cells. DAT by CAT is done as per the manufacturer's instructions (DiaMed-ID Micro Typing System, ID-Card “LISS/Coombs”). Grading of the reaction was done based on the pattern of agglutination. The study was approved by the ethical committee of the institute. Data were tabulated into an SPSS statistical software data sheet (SPSS Statistics for Windows, Version 17.0, SPSS Inc., Chicago, USA). The significance of the difference between means was calculated by the Student's t-test. Two-way contingency table analysis was done to calculate the predictive values. P < 0.05 was considered statistically significant. A total of 250 patients were studied. The largest group (160) was referred from the hemato-oncology unit. Forty-seven patients had autoimmune diseases, 14 had infections at the time of referral, and 29 had some form of gastrointestinal/liver disorder. 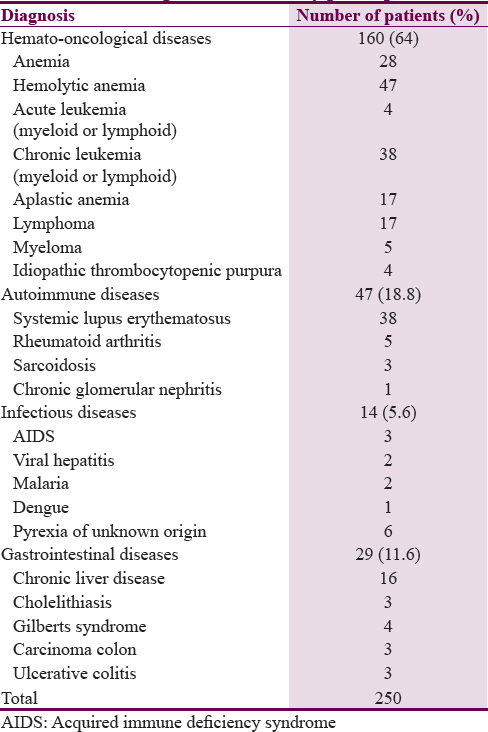 [Table 1] shows the details of clinical diagnosis in these patients. 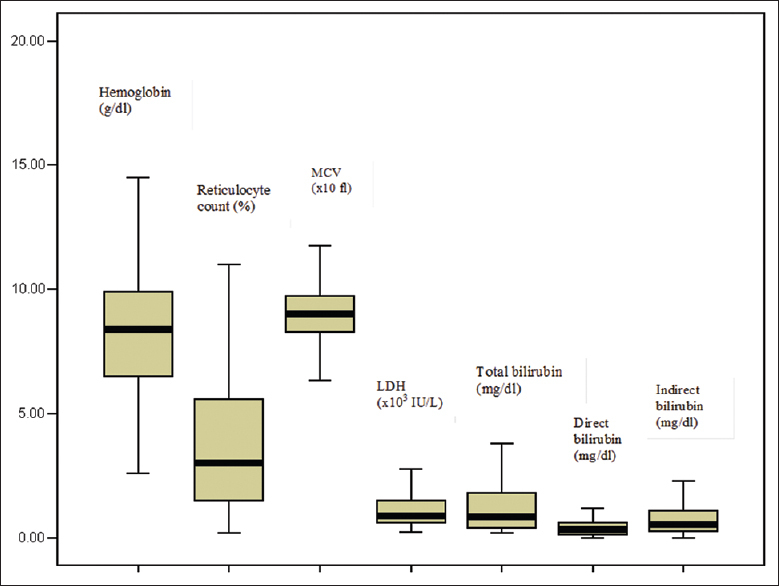 [Figure 1] shows box plot of laboratory parameters in the patients studied. It gives the mean values of indicators of hemolysis, namely reticulocyte count and serum bilirubin and LDH levels. One hundred and seventy patients had laboratory evidence of hemolysis. Seventy-eight (45.88%) of them had severe and 92 (54.12%) had moderate hemolysis as defined by the criteria described above. A total of 65 patients had a positive DAT by CAT. The majority of patients had systemic lupus erythematosus or hemolytic anemia as the referral diagnosis. However, among these patients, only 41 had positive DAT by tube technique. In this group, hemolytic anemia was the single largest cause. The comparison of different diagnoses by the two techniques is shown in [Table 2]. The positive predictive value (PPV) of tube test was higher than that of the CAT (75.6% and 72.3%, respectively), but the difference was statistically not significant (P = 0.707). The present study gives details of various clinical conditions in which DAT is performed and the results are correlated with the in vivo hemolysis. Cid et al. gave the referral pattern according to the referring department. They had most of their referrals from either internal medicine or hematology department. As expected, the hemato-oncology department had referred the highest number of cases in our study followed by immunology department. As in other studies, we have also used hemoglobin, MCV, reticulocyte count, LDH, and bilirubin levels as markers of hemolysis., Unlike them, we have not included haptoglobin in our study. It is assumed that the evidence of hemolysis is stronger as the number of positive laboratory parameters increases. On analyzing the requests for DAT, we found that 68% were appropriate as the patients had ongoing hemolysis. It is known that CAT is more sensitive than CTT for DAT. As in our study, Paz et al. have also observed several cases where only CAT was positive (24 out of 42 patients with a positive DAT). In their study, 18 of them had positivity by both the tests. We also have 41 of 65 positive cases proven by the tube test, whereas in 14 cases the CAT-DAT was positive and CTT-DAT was negative. As in their study, we have not observed any case which is negative by CAT but positive by the tube technique. 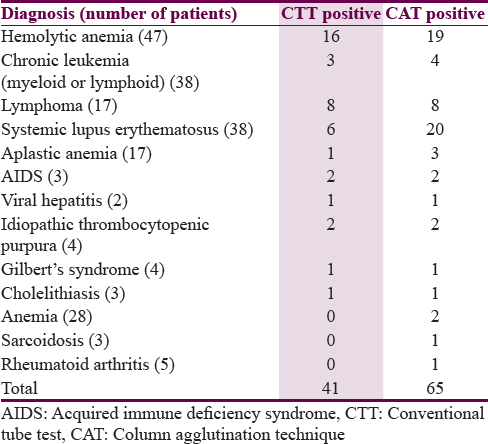 As shown in [Table 2], it may be noted that systemic lupus erythematosus was the single important cause of discrepancy between the results of CTT versus CAT-DAT. In this group of patients, it is likely that even in the absence of hemolysis, the attachment of auto-antibodies and /or the complement components to the red cells resulted in a positive DAT by CAT. As shown in [Table 3], it may be noted that the DAT positivity rate increased with the severity of hemolysis. The PPV of CTT is higher than the CAT, but the difference is statistically not significant, indicating that both the tests are comparable in predicting the hemolysis. When we compared the grade of agglutination to the hemolysis [Table 4], PPV of CAT with an agglutination grade of 1+ is low. Hence while reporting the results of DAT, it is advisable to mention the grade of the reaction. Patients with lesser grade of DAT positivity by CAT may be managed less aggressively. A literature review performed on DAT positivity among healthy blood donors revealed that donors with positive DAT result rarely have clinical evidence of hemolysis. It was noted that some jurisdictions considered the strength of DAT reactivity to decide on the donor deferral and notification. We compared the patient's laboratory profile with the DAT results as shown in [Table 5]. These parameters were comparable between the groups, except for reticulocyte count and total bilirubin levels. Higher levels of these two laboratory indicators of hemolysis were seen in those positive by CTT-DAT. The present data also give an insight into the clinical use of DAT. The predictability of hemolysis is proportionate to the strength of DAT reaction. The PPV of DAT is high when it is done in patients with strong clinical suspension of immune hemolysis. Hence, DAT results will be evaluated from the perspective of patient's clinical profile. Although the tube technique appears to be a better predictor of hemolysis, the use of the tube method alone might have missed some cases with severe hemolysis. We recommend the use of CAT for DAT along with the mention of strength of agglutination in positive cases. These details are expected to assist the clinicians in decision-making and to monitor the patients who are on treatment for autoimmune hemolytic anemia. Wheeler CA, Calhoun L, Blackall DP. Warm reactive autoantibodies: Clinical and serologic correlations. Am J Clin Pathol 2004;122:680-5. Das SS, Nityanand S, Chaudhary R. Clinical and serological characterization of autoimmune hemolytic anemia in a tertiary care hospital in North India. Ann Hematol 2009;88:727-32. Brecher ME. Direct antiglobulin testing. Method 3.6. In: Technical Manual. 15th ed. United States: AABB; 2005. p. 760-1. Cid J, Ortín X, Beltran V, Escoda L, Contreras E, Elies E, et al. The direct antiglobulin test in a hospital setting. Immunohematology 2003;19:16-8. Dittmar K, Procter JL, Cipolone K, Njoroge JM, Miller J, Stroncek DF, et al. Comparison of DATs using traditional tube agglutination to gel column and affinity column procedures. Transfusion 2001;41:1258-62. Paz N, Itzhaky D, Ellis MH. The sensitivity, specificity, and clinical relevance of gel versus tube DATs in the clinical immunology laboratory. Immunohematology 2004;20:118-21. Hannon JL. Management of blood donors and blood donations from individuals found to have a positive direct antiglobulin test. Transfus Med Rev 2012;26:142-52. Parker V, Tormey CA. The direct antiglobulin test: Indications, interpretation, and pitfalls. Arch Pathol Lab Med 2017;141:305-10.